Polymeric composites reinforced by glass fibres have been replacing metals in a variety of applications in mechanical and civil engineering in the past years. Besides the conventional fibre composites there is a growing interest in plant fibre composites. For both materials there are very few NDT techniques available. Within the framework of the FIBRINS project that is being funded by the European Community a NDT technique based on low energy radioscopy and computed tomography is being developed. The aim of the radioscopy technique is to introduce a fast inspection method that can be integrated in the production chain. The computed tomography technique was developed to investigate bodies with a complex structure that cannot be inspected by ordinary radioscopy. The system comprises of a microfocus x-ray tube, a high precision positioning system and a newly developed x-ray detector based on a large fibre optic taper bonded to a large area CCD chip with a resolution of 2048*2048 pixel. The spatial resolution of the x-ray detector is 25 microns with a density resolution of 16 bit. The composite material manufacturers provided different test bodies and materials to test the inspection techniques. The technological challenge is to inspect materials with very similar density between fibres and matrix. As an approach to achieve an optimum contrast between fibre and matrix a dual energy imaging method was applied. Both methods were used to inspect glass fibre and plant fibre reinforced test samples with the aim to verify the relationship between manufacturing parameters, sample structure and the mechanical performance. The results of the project will help fibre material manufacturers to improve the quality and reliability of their products. The introduction of plant fibre based composites as a new group of materials and the steadily increasing application of conventional fibre composites has lead to an industrial demand for new, fast and reliable nondestructive testing techniques. Glass fibre composites are used for high strength engineering applications for pipes, storage tanks and other high risk areas. A new, environmentally attractive supplement to traditional fibre composite materials are offered by composites made of plant fibres. They are made on the basis of natural cellulose fibres. Therefore they are combustible, compostable, renewable and CO2 neutral. Additional attractive properties are their availability and their low weight. At present, the industrial interests are particularly related to the applications in the transportation sector, e.g. for panels. However, it is expected that R&D will lead to an improvement of the mechanical properties that may cause a widening of the application area also for structural (load bearing) applications. Plant fibre composites are currently gaining significant interests (e.g. [1-3]), mainly on assessing mechanical properties, the reproducibility on different manufacturing routes, the influence of variability of the raw material and to prevent moisture causing damage to the fibres. Plant fibre composites may have similar mechanical properties as conventional (e.g. glass fibre) composites, although with a lower impact strength. Since plant fibre composites constitute a relatively new group of materials, the limitations imposed on the mechanical performance due to flaws are not well known. In these respects, numerous destructive and non-destructive characterisation techniques may be applied in order to obtain a maximum amount of information on the processing, the structure, the microstructure and the mechanical performance. The work reported in this paper has been executed in the framework of an European research and development project by the FIBRINS consortium, funded by the European Community under project No BE97-5129. The focus of this paper is on x-ray based NDT-techniques for both glass fibre composites as well as plant fibre composites. For a more detailed report about nondestructive characterisation of plant fibre composites refer to . In this paragraph the investigated plant fibre samples are shortly described, because they are not as commonly known as glass fibre composites. The plant fibre materials considered are mostly based on jute nonwoven fibres in a polypropylene matrix. Jute is a natural fibre obtained from the bark of the jute plant, which grows in the south-east Asia. The fibres are about 15 - 25 mm in diameter, usually grouped in bundles of about 0.1 - 0.15 mm in diameter. The bundles may extend for meters. The basis for the structure and strength of the fibres are the cellulose molecules which form a sometimes crystalline structure, where the cellulose chains are stabilised by hydrogen-bonds between hydroxyl groups and oxygen atoms. The stiffness of jute fibres varies from 10 to 70 GPa, with a density around 1.46 g/cm3. In comparison, glass fibres have a stiffness of about 70 GPa, and a density about 2.54 g/cm3. The density of the polypropylene matrix is 0.906 g/cm3. Most of the presently considered samples are of rectangular shape, measuring 40 by 30 cm2, 4.0 to 4.6 mm thick. Different manufacturing variables are considered: type of reinforcement, varying fibre orientation, low and high volume fraction of fibres and in the case of plant fibres varying moisture content of the fibres. 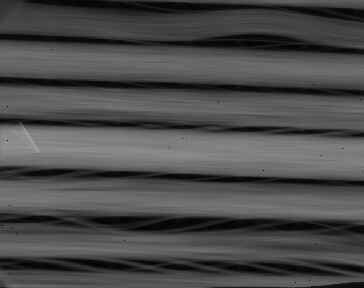 X-ray imaging of fibres and fibre bundles combined with strength tests are important, because the consequences of different defects on the performance of fibre reinforced composites are still little known. The aim is to predict the influence of the population and location of defects, of different fibre orientation in the reinforcement or of the manufacturing processes on product performance for conventional fibre composites and plant fibre composites. The materials are difficult to inspect, owing to very similar response of fibres and matrix material on x-rays, especially in the case of plant fibres. In order to define the potential and the limits of x-ray related real time techniques, a series of samples of different fibre geometry have been inspected systematically. Industrial x-ray sources with focus sizes of 0.2 mm and microfocus tubes have been applied in combination with different x-ray detector types. Radioscopic images taken by means of scanning the fibre reinforced samples with a 200 mm linear diode array with 2048 pixels have been compared to those taken directly by a high quality radioscopic system with image intensifier type (GAMMASCOPE GS300) as well as to those taken with a flat panel detector. The flat panel detector is based on amorphous silicon with 1024 x 1024 pixels and a pixel size of 400 µm. 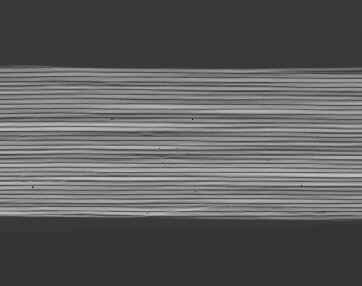 Due to the combination with the microfocus x-ray source with a focal spot size of about 10 microns all detectors could have been used to visualise not only the fibre bundles but also the individual fibres of the samples. Fig 1: Radioscopy of a glass fibre reinforcement. The unidirectional orientated fibre bundles are visible. Fig 2: Enlarged segment of the sample of figure1. Individual fibres of the fibre bundles are visible. Based on the systematic study of samples, described in the last paragraph the FIBRINS consortium develops a prototype of an x-ray inspection system for fibre reinforced composites. One of the industrial partners (Photonic Sciences) is developing a new radioscopy detector, which is optimised for x-rays of low voltage, like they are used for the inspection of fibre reinforced composites (e.g. 30 - 80 keV). The features of the detector are high resolution and a wide dynamic range. The directionally optimized scintillator with a diameter of 150 mm is coupled to CCD by means of well bonded directionally aligned fibre optics. The peltier cooled CCD with a dynamic range of 16 bit has 2048 x 2048 pixels. By this an active pixel size of less than 50 microns is achieved. One of the research institutes involved in the FIBRINS consortium (Risø National Laboratory) is developing a software package for dual energy imaging. The main idea is to enhance the possibility of distinction between fibre and matrix materials in the x-ray image. This is particularly relevant for plant fibre composites, since the fibres and the matrix have similar radiation attenuation characteristics. However also in case of conventional fibre reinforced composites the dual energy imaging technique permits a fast and effective "background correction" in order to facilitate the detection of defective structures. Another industrial partner (CBI&M) is developing and manufacturing a prototype of a manipulating system for the handling of various objects, mounting devices for the detector and the x-ray source as well as the computer control. The WÄLISCHMILLER company will integrate the detector, a microfocus x-ray-tube, the manipulating system and the dual energy software together with own software into a combined system for high resolution radioscopy and cone beam computed tomography (3D-CT). The latter technique is important for the inspection of bodies with a complex structure, where radioscopy would lead to ambiguities. For further details about 3D-CT refer to . A combined system for high resolution radioscopy and computed tomography is being developed based on a new detector for low energy x-rays. The new system is an important tool for quality control of polymeric composites reinforced by glass fibres or plant fibres. A new software for dual energy imaging is aimed to achieve an optimum contrast between fibre and matrix material. Lilholt, H. & Bjerre, A. B., "Composites based on jute-fibres and polypropylene matrix, their fabrication and characterisation", in Proceedings of the 18th Risø International Symposium on Materials Science: Polymeric Composites - Expanding the Limits, Risø National Laboratory, Denmark, 1997, pp. 411-423. Mohanty, A.K. and Misra, M., "Studies on Jute composites - a literature review", Polymer Plastics Technology and Engineering, 34(5) pp. 729 - 792, 1995. Rheinländer, J.T., "Quantitative Non-Destructive Characterisation (NDC) of plant fibre composites", 9th Annual Symposium on Non-Destructive Characterisation of materials, Sydney (Australia) June, July 1999. Simon, M., Sauerwein, C., "Quality control of light metal castings by 3D computed tomography ", presented at the 15th World Conference on Non-Destructive Testing, Rome (Italy), October 2000.